Experience some of Alaska’s most spectacular destinations throughout this 7-day luxurious motor coach and rail tour of the Last Frontier with the perfect mix of urban sightseeing and wilderness exploration. Discover all that Anchorage has to offer, from superb dining and a vibrant art and culture scene to a multitude of outdoor recreational opportunities before heading north to Denali National Park and Preserve. Immerse yourself in the solitude and uninterrupted beauty of the six-million-acre park as you travel over the highly restricted 95-mile Denali Park Highway, accompanied by naturalist guides. Enjoy dinner and a show at the Music of Denali Dinner Theater at McKinley Chalet Resort featuring family-style dining and a spirited original musical about the first men to reach the summit of Denali. The second half of your Alaska adventure takes on another of the state’s picturesque highways as you travel along Turnagain Arm on the Seward Highway south to the quaint port community of Seward and its magnificent views of Kenai Fjords National Park. Bring along a pair of binoculars for a once-in-a-lifetime whale and glacier-viewing cruise. For the grand finale, ride onboard the Alaska Railroad glass-domed railcar as it chugs through the spectacular Kenai Peninsula backcountry. Upon arrival in Anchorage, shift into vacation mode with a relaxing day of independent exploration of Alaska’s largest city, nestled between the Chugach Mountains to the east and Cook Inlet to the west. We will transfer you from the airport to your hotel and the rest of the afternoon is yours to tour the city at your pace. Enjoy the shops and restaurants in the vibrant streets of downtown, stretch your legs along Anchorage’s many trails, hike in the Chugach Mountains or take a seat and enjoy a local brew and some live music in town. Several activities such as flightseeing and bike rentals are available for purchase as well. Overnight in Anchorage. Grab a coffee and some breakfast and hop onto our deluxe motor coach for a scenic drive south to Portage Lake. As you leave Anchorage, keep your eyes peeled for pods of beluga whales swimming in the waters of Turnagain Arm or see the dramatic tides as they come in over glacial mudflats. Board the mv Ptarmigan at Portage and cruise among the many icebergs dotting the lake, situated in a heavily glaciated valley at the foot of the impressive and actively calving Portage Glacier. Next, get your first glimpse of Alaska’s four-legged inhabitants at the Alaska Wildlife Conservation Center. Not your typical zoo, the conservation center lets you safely get up close to these rehabilitated or orphaned animals and view them interacting and roaming around as they would out in the wild, thanks to their large, natural enclosures. Stroll along the BEARS boardwalk in the newly expanded brown bear enclosure and, if you’re lucky, you may get to see a feeding while you’re there. Return to Anchorage for the evening and let the day’s events set in over a hot dinner and drinks. Overnight in Anchorage. 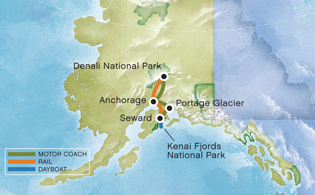 Wake up to a new morning in Denali and take the bus back to Southcentral Alaska, past Turnagain Arm and down through the Kenai Peninsula to the community of Seward. The route along the Seward Highway is a destination in and of itself and was named by the U.S. government an All-American Road thanks to the magnificent views of forested, snow-capped mountains, green slopes, canyon creeks and sparkling lakes that accompany your ride along the way. The town of Seward is no less impressive, nestled on the coast of Resurrection Bay and Kenai Fjords National Park. During summer months, Seward’s harbor is the place to be; bustling with life and offering exciting adventures such as sea kayaking, salmon and halibut fishing charters and glacier cruises. Don’t pass on an evening or afternoon stroll down Fourth Avenue in downtown Seward and sample fudge, gelato or scrumptious baked goods at the eclectic shops and galleries along the way. Overnight at the Seward Windsong Lodge. On the final day of your trip, our crew will take you from your hotel to the airport before bidding you farewell. Want to experience more of Alaska? Extend your trip with your choice of a variety of exciting Gray Line tour options!